When Arthur Jones tested people throughout their range of motion after the development of MEDX he found that only about 20% of the people who exercised through a partial range of motion had gains through the full range of motion. Therefore, the argument for static exercise as an ultimate exercise is moot for the general population. Why the revision of static exercise? What do you know that I do not? To begin with, it should be noted that the RenEx position on TSC exercise is not conclusive with respect to a stand-alone program for total body fitness. We have some ideas about what we believe is possible but at this stage we do not suggest that TSC should replace dynamic exercise except in those cases for whom TSC is the only possible option. We have been very impressed with the results of TSC as viable technique that can be used in addition to dynamic, as a rehabilitation technique, as a pre-exhaust mechanism, and even (for some) in whole body workouts but we still have ways to go before declaring any broad generalizations. What we do know is that TSC is very safe and very productive. Our collective experience in the RenEx team is that it is the most promising development in the field of strength exercise to date. TSC permits us to instruct exercises that ordinarily rank as unsafe. It helps us teach proper protocol. It helps subjects connect their neurologically inefficient muscles to their minds so that they can recognize which structures they are attending to. It helps circumvent joint debilities and derangements. And, it can exist in its own right as a powerful independent technique for muscular stimulation. The type S and G curves that you reference from MedX have been the subject of much debate and consideration. It may very well be true that specific vs general adaptations can occur from one subject to the next when considering aspects of exercise such as range of motion. Exercising in a partial range may indeed promote strength increases only in the trained ROMs in some while presenting increases in the full ROMs in others. But before we concede this it is important to consider the methods used to arrive the conclusions that MedX did. Because the standards of loading with Medx are borrowed essentially from the nautilus model, it is our contention that the gauge for set volume was not only low but also highly inconsistent. At the suggested 4/4 cadence (though better than 2/4), regardless of range of motion, the subject is moving too quickly to expose the structures to the kind of loading that could indeed reflect adaptive variations due to ROM. Stated simply, a 4/4 protocol is not remotely controlled enough to conduct such an experiment validly. In TSC exercise, the loading sequence and timing is strictly enforced with a “no escape” modality that encourages a continuous and effective loading of the structures. The effect is so potent that our contention is that eventually, regardless of position, the majority of the structure will become involved, if not fatigued and inroaded. This can be easily felt during an advanced TSC workout. Of course, such an advanced workout requires significant experience and practice and is remarkably uncomfortable, even to the extent of promoting sensations of deep muscular damage during the performance of the set. But the effect of such effort is an unmistakable depth of loading that leaves little doubt as to the totality of work performed by the target structures. In my own practice, I have worked with feeble subjects that couldn’t perform dynamic exercise (pulldown) because of pain in the elbows as well as overall weakness. But after one year of consistent TSC pullover/pulldown exercise, the subject was able to adapt to full range dynamic PD with zero pain and a rapid progression to resistance values that would ordinarily have taken many more weeks, by my experience. In the case of one male who couldn’t perform 6 repetitions with #60 in his first attempts on the dynamic machine, i was able to progress him to #135 over the course of 4 weeks after having done only static exercise prior to this for 9 months. This is a remarkable achievement and directly flies in the face of the type S and G theory. Of course, this subject could have been considered a type G subject but we are seeing this sort of thing in larger numbers and across a broader and broader spectrum of subjects making it far more likely that even S type subjects are going to respond the same way. In a related ongoing anecdotal experiment, I have started many of my clients on the Renex Trunk Extension after having worked on the MedX lumbar machine for (in some cases) years. 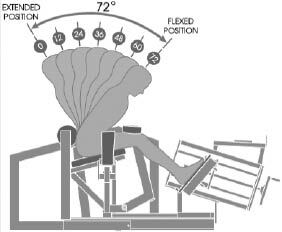 The maximum range of motion in the MedX is 72 degrees although in Renex protocol we never have gone past 50 degrees because of compression force concerns in the flexed position. The RenEx machine can provide a range of motion of over 135 degrees. Most of my subjects have easily been able to adapt to the increased range of the new machine. In many cases, subjects are achieving 120, 125 and even 130 degrees of range with ever increasing weights. Of course, in the beginning of such a change I am deliberately being conservative with range of motion and even more so with weights but it hasn’t taken some clients long to achieve comparable statistics in the new machine and with a dramatic new range of motion to boot. With all of this said, there is one more thing to consider. It is very challenging to distinguish between the effects of skill acquisition and strength, particularly early in a program. In fact, that line is most blurred during a critical period of growth during intermediate levels of exercise in a give routine. A subject improves in a relatively non-linear way in terms of his capacity for ROM, total resistance, and the demonstration of endurance within a given protocol. What improves over a given time frame includes many aspects including motivation, strength, skill, nervous system communication, cardiorespiratory improvements and many more. After enough time has passed within a given paradigm of exercise, the subject will “top out” aspects such as skill, and neurological learning. Even motivation will reach a pinnacle. Eventually, the only thing that will permit any demonstrable statistical improvement is what we might call strength. Since it may take a considerable amount of time to achieve the state of increasing “strength”, perhaps the assignation of type S and G curves is moot. What if a type S subject just needs a handful of brief workouts in his previously untrained ROM to then demonstrate equal strength in that ROM a very short time later? In the end, this and other questions might be better answered as we delve deeper into TSC and the future of exercise. If you haven’t picked up your copy of The Future of Exercise Event DVDs, do so here! Gus, this post is so solid that I doubt that there is any valid way to debate it . It will be interesting to sit back and wait for them to try. No takers so far!!! Can you describe in more detail the “type S and G curves”? I think this is a huge question that I’ve been wondering about. I’d love to tell clients with complete confidence that functional strength can be achieved with static exercise alone. Based on experiences and testimony it appears to be true. I’ve found when working through partial range of motion due to pain/injury that the pain area can be diminished over time until a fuller range is established. Does this indicate that the entire musculature of that joint is being strengthened regardless of the range of motion? Thanks, Josh, for the Arthur Jones Collection link – it helped clarify the points made by Gus. The comparisons between a Type G and S subject may be invalid based on other factors. It’s very interesting how time spent doing TSC inevitably improves one’s ability on a given dynamic exercise. When someone is stalling on a shoulder press, for example. So far it’s worked every time. This is great stuff. The idea is that some people are put together in a way that permits them to get stronger throughout the entire range of motion in a given exercise regardless of if they have only exercised a partial range in that exercise. And that other people will only get stronger in the particular range of motion that they used in the exercise. Again, all i can do is tell you that i personally believe that TSC exercise can render this concept not accurate or perhaps oversimplified. At the very least, I can state that i’ve experienced what you have; that people are able to substantially reduce their pain, increase their range of motion, and ultimately increase strength throughout a range of motion that exceeds their static training ROM. Ken’s theory about TSC (that if worked with enough effort, the entire musculature must become involved regardless of position) has always made visceral sense to me. And it seems to be substantiated in innumerable ways in my practice with clients. I personally have great confidence in suggesting to my clientele that TSC can promote overall improvements in strength (or as you call it, functional strength). Fortunately i have been doing TSC for many years now and have seen some amazing success stories so the concept is not nearly so far a reach, intellectually. For many reading here, this may all seem a little far fetched but as i’ve said many times before, all it takes is one combination set of static pullover/pulldown to experience what might be possible with this type of isometric exercise. Time will tell us much as we move forward, i am sure…. Thank you, Gus. Your work is phenomenal. Gus has been very busy, too busy to post, but I forwarded him your compliment and he says: Thank You!!! This is an excellent explanation of the RenEx philosophy on TSC. It is clearly an evolving analytical process to uncover the truth that will benefit all end users. Thank you. Looking forward to more discoveries as they unfold. On behalf of Team RenEx, THANK YOU! I’m looking forward to these questions and answers as RenX learns more and more regarding TSC. TSC is a protocol with many different sides to it. I can tell you with certainty, YES!!!! Man, what a lo#32s8&s0; 2009 has seen alot of DJ’s passing to the big wheelsup above! I burned through so many TDKs on this and Red Alert show. What would any of us be with out it? I hope our knee series puts these fears into perspective… we have part IV coming out soon to conclude the series. We do discuss it even more in Vol 2 of the technical manual due out in 2014. “To instruct exercises that ordinarily rank as unsafe”, this would be a great benefit for many people. Do you think that TSC could also be used as a method to help people learn how to deeply inorad. I am often asked how to get people to increase their effort when exercising could I suggest using TSC. Yes, TSC works very well in a workout that includes dynamic as well as static exercises. Blending TSC exercises with any combination of dynamic exercises can help any subject improve his concentration and increase effort. In dynamic exercise sometimes we can become wired and stressed. A TSC set can serve to calm us down and blot out the noise. It can literally teach us to channel our effort to the most important aspect of strength exercise which is to maximally contract the target structures and to eventually inroad them. TSC promotes stillness which is an often overlooked necessity in a well-performed workout. This naturally leads to better focus and a much higher likelihood that we can override the pain that accompanies high effort muscular work. Always, it never stops…THANKS 4 UR SUPPORT! I work with the young man in the above photo. I have observed a workout and he literally can wretch out every ounce of effort out of his body with darn near impeccable form. He is very intelligent and is doing independent studies that are raising my awareness of what I’m doing. The TSC is interesting to me as are the 10/10 based dynamic work. Keep up the good work. Thanks for the comment…..I could tell from his questions at the conference that he is a deep thinker and a very intense guy. Perhaps you will share more about the both of your workout experiences. It could just be a simple case of the assumed objective vs. The real objective with the type s subjects falling into the former and the type g subjects the latter. Also perhaps as far as skill acquisition is concerned, in the field of sports science there are what are known as closed skills and open skills. A closed skill involves performing a single deliberate movement that doesnt change much if at all , such as a golf swing or dart throw, where as to attain open skill involves the ability to understand the ‘feel’ of the game so that a player can adapt to any situation even if they have never used that technique in practice. @all does anyone think there is some relationship between this and skill in exercise? Of course, such an advanced workout requires significant experience and practice and is remarkably uncomfortable, even to the extent of promoting sensations of deep muscular damage during the performance of the set. Gus- do you know if this is actually a good thing? or are you guys just experinementing with rapid inroading to the point where it may actually be dangerous? The beauty of ffeedback-based TSC is that it gives us “eyes” that we never had before. We can immediately detect risk factors and keep clear of danger. What we know thus far is that if one follows the protocol, TSC is safe even at the advanced levels. We also know (for a fact) that performing sets of shorter duration than our prescribed protocol and with too rapid an inroading process can cause injury. No different than choosing too heavy a load and attempting a one rep max. Reviewing the photos of the RenEx seminar I see the elderly and the emaciated. Was there anybody present that would represent the average lifter? Is the John Hopkins study underway now or will your machines gather dust for another year before the study begins? It must make you feel particularly manly to insult and disrespect people in photographs attending a learning and educational seminar. And to single out folks for their age and their body type takes a real special kind of classless, oafish bully. You should be flat out ashamed of yourself. I don’t want to speak for the RenEX team but I have found that it is not the leg extension exercise that causes injuries, it is the exercise equipment that causes the injury. I have found on some leg extension machines I feel strain/pain in my knees immediately. I think that the trainers who know nothing, is that they know nothing about the biomechanics of the knee and the required engineering of machines to match the biomechanics of the knee. For the so-called experts to come out and admit this would mean that they are not so-called experts or leaders in the field but just followers. But most in the exercise field are just followers. I want to play with you longer? What does db144 stand for – is this code for “average lifter”. What does he mean by “average lifter”, what is old? Josh remember db144 is interested enough to look, db144 meant to say, “I want to play with myself longer” – well db144 nobody is playing with you here. His name is Dave, he seems very miserable and dissatisfied with training. I have no idea what a “lifter” is. He may have feelings for me. Josh are you ready to compete again or are you going to spend the rest of your life calling yourself a pro bodybuilder and never attend another competition? As usual RenEx can’t deal with the facts and attack those that disagree with you. First step is hide the truth and the second is to continue telling lies until people believe you. The facts are RenEx, the child of SS, is a failed application for maximizing muscle growth. For 30 years the SS fools have blamed the equipment for the failure of the methodology and your “master” has grown fat “upgrading” the machines over and over again but now you’ve “fixed” the flaw with a new series of expensive machines or so you say. Stick to the rehab business because nobody will reach their max. genetic muscular level using RenEx. If it could you’d be posting the proof instead of talking and talking and talking. outrageous, empty claims you and your RenEx monkeys post all over the net. Dr.Darden is the benchmark huh? I will bet I have prepared and trained more bodybuilders(natural) in the last few than all of his years combined. I doubt there is a HIT facility in the world that has done more of this than we have. The funny thing is I’m not even pursuing people in that area. This is for db144, I want to extend a personal invitation to you, I know you don’t live very far away, to meet me for a workout. I work at Main Line Health & Fitness, 931 E. Haverford Rd, Bryn Mawr, PA 19010…we are the first of only 2 clubs in the USA to have a full line of XForce Machines. I will put you through an XForce workout. We also have a room where RenEx protocol workouts are performed using MedX Machines, the next best thing to RenEx or older SS Systems for the protocol. (A very distant second) You decide what’s best! I’ll even introduce you to people who like XForce and many of my clients and fellow trainers who have been training RenEx style, who have made amazing gains in strength and size and some who have lost 40lbs of fat.I have a guy I’ve been training for 6 years, the past 2 using RenEx only. He’s 5’9″ and weighs 265 12% fat, drug free for life, he’s put on 25 lbs of solid muscle since starting RenEx. I have used XForce Machines and RenEx Machines. Phone me at 610-527-2200. Well, the challenge has been offered, time to put up or shut up. In the mean time I’ll go back to coaching my average lifters…LOL. Good news about the pay site. Interesting you work for Main Line.I met recently Roger Schwab at the Fibo in Germany and talked to him about x-force and renex. Sent him best wishes from me ,if you don’t mind. I incorperated for a few workouts the shrugg on the OME as you suggested in a former article.I’m getting more out of it recently since concentrating on pro/retracting of the scapula at the end/start of the rom. Took some time to get the groove. I agree with others that the dvd’s are worth the money .I ‘m using the TSC with succes with some clients and it accelerates their learning curve.And that is without a graphic device. Can you elaborate a bit more on the pay site? We have tons of content to put out, but we would like to reserve it for the ones who are truly interested in advancing exercise rather the the dogmatic HIT group stuck in the past. We want to be past all of the bickering and just get down to the meat of this thing. We will be fulfilling a number of pieces every month for a private audience for a small monthly Fee. Likely we will still put up a couple articles per month for general viewership. An “average lifter” is a person that does not have a physical ailment that requires special attention during training, not collecting disability or retired, not dangerously skinny looking for the next muscle in minutes fad to gain weight, not a competition attending bodybuilder or powerlifter, and finally not a convert who has built muscles and migrated to RenEx who now acts as if their body was built using only RenEx equipment (the marketing campaign is compliments of Arthur Jones). Your everyday average lifter is one that desires to safely build muscle to enhance or maintain a level of fitness that will allow them an active lifestyle as they age. You know the group that constitutes the vast majority of the weight training world. In reference to the attitude over using the word emaciated. The use of the word was accurate and it is your twisted minds that push your interpretation of the word into my statement. I don’t feel the need to sugar coat words to avoid hurting feelings. Seems you’d rather give someone a soft word and a pat on the back and not much else instead of telling them the truth and moving forward to find a solution. Please try to remember I’m not the narcissist that regularly posted videos and 10 year old photos of myself on Dr.Darden’s website all the while yelling look at me, look at me and what I’ve done. As I said before RenEx is incapable of putting the facts forward but instead will talk and talk and talk. Oh, and try to run down anyone that doesn’t bow to the their supposed genius and newest gimmick. You’ve had your shiny toys for more than a year. Release 12 or 15 case studies and results or keep talking, which is what you’ve done for what seems an eternity now. So, you only want to hear from “average lifters” ? By your own definition which excludes: A person with injury, rehab needs or pathology. Excluding extremely skinny people, excluding the retired or elderly, excluding bodybuilders and powerlifters and excluding anyone who worked-out with conventional methods prior to RenEx. Sorry, I have no “average lifters” to show you. lol…you can’t be for real, are you? I’ll come back in another year and remind you of the lack of studies and research, again. RenEx is not a research institution although we just so happen to draw interest from these communities. I’m curious how you guys would go about a workout if you only had access to free weights or selectorized machines that are not properly cammed for the RenEx protocol. Josh, I know you have written quite a bit about using bodyweight exercises in the absence of good equipment. From what I have read, you guys still recommend 10/10 for bodyweight exercises? I’m curious if you guys limit range of motion on non ideal equipment, change cadence, etc. I seem to remember some of this being touched upon. This may be stuff covered on the FOE dvds? If memory serves me correctly Josh, on your squat video you were using 10/10 and a full range of motion? This is the single most common question we get. Ken Hutchins and I will be completing this DVD series for fall of 2013. This should be really interesting stuff. I currently do most of my workout on selectorized machines. I feel like I am quite in tune with the various movements I do. When I reach a mechanical sticking point from fatigue I think about what Ken says about not caring if the weight will move, just keep contracting in good form. I will say that on the leg press I use, finding the right amount of resistance seems to be trickier than other movements. Do you guys talk alot about “movement synergy patterns” in the ROE book and or the FOE dvds? Josh caught my attention touching on this fairly recent on bodybyscient dot net. No we don’t discuss this too much, it actually part of the certification. I understand. Well I would say you all have been more than generous with all the information you have shared. Would be nice to schedule a workout session at one of your facilities sometime just to really experience what you guys do and apply that experience the best as possible to what I can do. TSC. How can this be applied effectively without your specialised equipment and visual computer feedback. 147 bucks i do intend to part with, in the not to distant future. How about a little appetiser now, – ? however i have read that article, and it raised some questions, including the one i have asked here. For me, i feel my option with standard equipment plus barbells/dumbells etc is to do a static hold for 60-90 secs to failure, prior to dynamic work as a way of mimicking Ren X TSC protocol. Is this viable or have i missed the barn door ? I have viewed the RenEX DVD’s and liked the DVD that Josh included on the bodybuilders who trained using RenEX protocol. It appeared from the bodybuilding DVD that many had reached their genetic muscular potential. After watching the DVD on TSC I trialled the TSC on MedX equipment where I train by pinning the equipment in various position. I gradually increased the force until a point where I felt a an even level of force. What I found and at approximately 75 seconds I felt throughout the whole muscle a high level of muscle inroad – effort went up – muscle fatigued – I found that this was the same on all exercises. The next time I go to the gym I an going to trial TSC/Dynamic method on a number of exercises and see what the results bring. I highly recommend if anyone wants to make informed opinions/judgements on RenEx to purchase the DVD’s. thank you for the feedback! glad you enjoyed! I think Arthurs results were almost meaningless because static testing is inaccurate. You can take all of the MedX research based on static testing and the conclusions from it for what it is worth and chuck it in the toilet. Basing a cam for exercise on the University of Florida strength norms was a joke. Static testing, even for research, is unethical. Arthur even knew it was dangerous and only recommended doing it just one time. Just read the patent on the medical lumbar machine…. All of that effort that was put into doing meaningless testing for meaningless non-scientific results. Too bad the funds were not spent improving the equipment instead. G and S barking up the wrong tree. “RenEx pricing is available by appointment only, nothing complex and nothing more”. If anyone thinks that is unfair, then they can go elsewhere. I know its popular to pile on RenEx , but I did not tell you that you need training to get prices. What I said was, the equipment is new and the features are new and a serious buyer would come into town so I could describe the features, the buyer could then tell me what they want, then I could quote them a price. Some machines can vary as much as $6,000.00 and you need to understand the “whys” and “what-for”. I did tell you that your quote would then include a 1 day workshop….its called “a machine operators course”- it is where we come into your place or you come out to ours to learn basic operation, set-up and maintenance of your machine. We prefer a full blown RenEx certification if you are going to become a licensed facility, but what I state above is the minimum requirement. If you took the time to see the machines you would understand why. I’m going to assume that I explained that poorly to you on the phone. If that is true perhaps you can post this on Dardens since I cannot. What is a high cost or a low cost? I train at a gym where the owner purchased MedX equipment back in 1994 at a cost of approximately $6000 to $10,000 per machine (he told me the prices). that works out at about $500 per year. He has never had to fixed them and they have never broken down. Go to most commercial fitness centre and they have a huge number of “cardio” machines prices ranging from $20,000 – $30,000 there are always a number of machines not working, to fix them can cost thousands of dollars. Some of the bigger commercial gyms can have up tp 50 diffrent types of cardio machines. Many of the weight machines are cheaply made and are often out of order and need replacing every few years. Another gym I train at has Nautilus Nitro machines most PT trainers don’t train their clients on them but most don’t even know how to use the Nautilus equipment or the reasons for the cams. If people are serious about RenEX they will make the appointment other than that most of your time would be wasted on people who are not genuine. I am glad that db144 defined “average lifter” and that he doesn’t sugar coat things, he has now shattered my “ego”. The price on the equipment is crumbs when you can get up to $110.00/ session for 20minutes of your time….personally i know of no other way to make this kind of money. -Look at that healthy young boy! That is today’s youth for you. They have no respect for elders. He rides on the donkey and makes his poor father walk! -Well, look at that! That poor little boy has to walk while his father rides the donkey. -The best thing to do is for both of us to walk. Then no one can complain. -Just take a look at those fools. Both of them are walking under this hot sun and neither of them are riding the donkey! I would like to see a Intellectual Debate between Brian Johnston and Joshua Trentine. Brian has been discussing him for many months on other HIT forums and I am ready to hear the debate. Sure we’re up to debate anything we stand for. I’d like nothing more…what point have we made that is being contested? but I’m nobody, I’ve only written an article or two on machines…why would he want to debate me? I might not be the most intellectual person in the world but a life time of experience (forty years) in the fitness industry gives me intellect to think for myself. I have seen every “fad” in the fitness industry come and go and there are always so-called experts trying to “con” people. I don’t need anyone telling me about unethical practices in the fitness industry, I think I am in a position to make up my own mind. db144 aren’t you up for the debate your the one coming onto this forum making all the criticisms and insulting people by calling them “average lifters”. And now you call in someone else to debate Josh, learn to stand up for yourself, standby your own criticisms and your own intellect. Not much to discuss here. 30 years of muscle building failure doesn’t lend itself to discussion. Stick with the rehab operation and the juicy insurance payments. Overload Fitness does not accept insurance. Starting to understand what Db is short for. When recording performance we use “db” for dumbbell. A rehab facility that doesn’t take insurance, give me a break. If the people here put some time into training instead of the 10 minutes a session once or twice a week on the new wonder toys they might see some results. I’m impressed to see that you are hitting the site 2x/day in light of us not posting anything new in weeks. Thank you for your continued interest. I think you will really enjoy the stream of information on the new private site. Your pay site nullifies the naysayers while pocketing some coin in the process…nice. How much will it be? I really hope its a reasonable amount so I can keep up here. TSC does not require special equipment, please refer to the chapter in the technical manual. ok, – ill buy it.